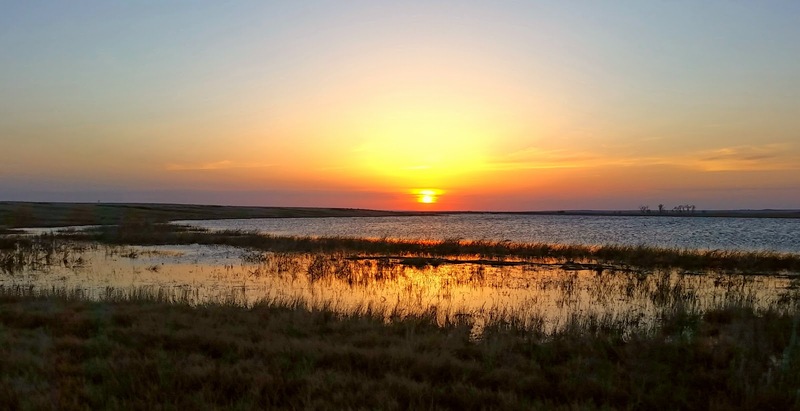 The prairie is an intriguing landscape - it can be exceedingly more rugged than you might expect, or be soft and endlessly rolling like swells on the ocean. Sometimes forested island mountain ranges pop up out of the sea of grass. Other times deep coulees or canyons filled with stands of piney timber - and big enough to swallow entire cities - are abruptly carved from what first appeared to be flat land. In the far east and north of Montana the prairie flattens and becomes wetter as the higher plains give way to the prairie pothole region. Throughout each of these terrains flow streams. Streams that wind through miles of empty space, draining vast pieces of America and southern Canada that most of the population never sees. Across northern Montana, each of these make their way to the Missouri River on their eventual path to the Gulf of Mexico. The waterways are not as plentiful as they are in the mountains. The relaxed landscape contains watersheds spread over many more square miles than those squeezed into the small spaces between ridges and ranges. Many of the tributaries only flow intermittently. Some perennial creeks flow muddy and are steep-banked. Many flow surprisingly clear. Often I can find pike or walleye in them. I've caught northerns in the tiniest trickles, in larger rivers, and in isolated ponds. None of these waters are places that many people purposely seek out. The locals fish them of course, but no one travels to Montana with these streams in mind. I enjoy the small opportunities I'm handed when travel takes me across them. I make sure to be ready. This time I was hoping for pike. My vehicle was packed. Everything I needed for a few days of work was in there. And then there was everything else - a tote with various boxes of plugs and bags of plastics, several spinning reels, just as many fly reels, three different lumbar packs prepped for spinning or fly, waders and boots, a net, and multiple rod tubes. Surprisingly all this recreational equipment fits into nooks and crannies and was out of sight. Hopefully there'd be time when each day's work was done. I knew there would be. I have a way of always finding that time. Even if it is dark before I start. I got three opportunities to walk along these waters. Each was at the end of the day with little daylight left, and each water was very different from the other. There wasn't time for research or poring over maps. 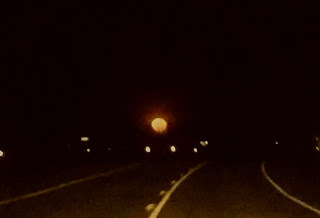 I had to take what was nearest and in-route to my destination. Each place I fished was nearly 200 miles from the previous. Once I stopped in a local sports store, but the man behind the counter could only recommend places I wouldn't be passing (but I definitely noted for future) and he knew nothing of the little streams I mentioned by name. 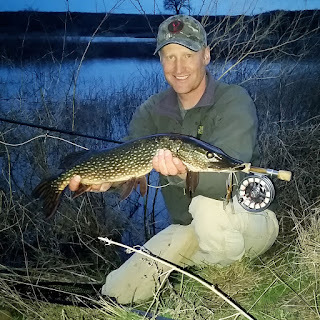 I had to use my gut and choose a water I thought should hold pike based on previous experience and research. The first evening was relatively unproductive. I was on a river I've fished before. A favorite river of mine for both trout and pike, but the water was still too cold, with my thermometer showing readings still in the upper 30's. I caught only one rainbow. The second evening was a quick stop along brand new water. I had my gps fired up and the land ownership maps loaded as I looked for a way to get to a particular stream. It drained into the Milk River, and I've caught pike in the Milk before. Perhaps there'd be fish up this tributary. Some state ground offered the access I needed to check it out, but I found the stream chocolate and the banks steep and exceptionally muddy from recent rain. It didn't seem that I'd be able to effectively work my way along it. Time was at a premium, but I decided to move on. I found an array of ponds with public access. It wasn't ideal, but I had less than hour of daylight. As I was hurriedly prepping for the water, a man and his dog pulled up in a pickup to check minnow traps. A compound bow with a single arrow in the quiver rested on the passenger side. Turkey maybe? A fellow opportunist apparently. He told me which of the ponds was best for pike. We tipped hats and parted ways. To save time I left my waders and stayed in regular boots. I strung up an 8-weight, tipped the beefy leader with a mouse, slid my big net down my back, and headed in the opposite direction than I'd originally intended to go. I often catch myself rushing hastily into opportunistic fishing situations. down, pretend I have all day, and pick the water apart with purpose and decisiveness. Ten intentional casts are better than a hundred fanned out without thought. As I slowed down I heard a turkey gobble off in the river bottom. The shoreline grass extended out quite a ways and I wished I'd wadered up. But casting beyond the grass was simple enough. 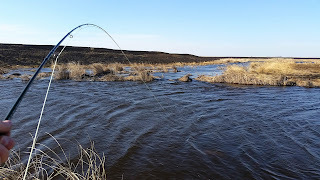 It was a perfect example of a fly rod being the right tool for the job - I could work the weed line without having to retrieve through the grass between casts. I brought the mouse to life while scanning for any movement in the shallows. A chorus of frogs piped up and reminded me that spring was truly upon us. I swam the mouse all around a shallow bay and then began to move toward water that appeared deeper. A coyote whined once the sun was fully out of sight. The water seemed alive - even smelled alive - yet I hadn't seen anything move in it. The slick surface erupted in that addictive way that can make a topwater junkie out of anyone after just one hit. I hadn't known whether I could coax one to the top or not. For that matter, I didn't really even know what was in this water, although I had no reason at all to doubt the minnow trapper. It'd been since late last summer that I'd had a topwater hit like that - since mousing for browns in the middle of the night before hunting season kicked in. Topwater hits add years to a person's life. They awaken your senses, clear your sinuses, and make you weak in the knees. The bottom drops out of your stress level. It wasn't even a big pike, but it was what I'd hoped for. My fingers mechanically took the line to the reel and I instinctively arched the rod around bushes and shoreline obstacles. It was kind of like I'd stepped back and watched the fight in third person, then set the camera up for myself and came to my own net assist. Before it was too dark to see I had two more hits. The visibility on the last was nothing more than the flash of white foam in the darkness and then a skinny white belly in the air. Both were smaller fish, and I brought one to hand. Not bad for less than an hour on new water. It felt great to break the long winter spell of no topwater action. Thanks to the minnow trapper for pointing me in the right direction. 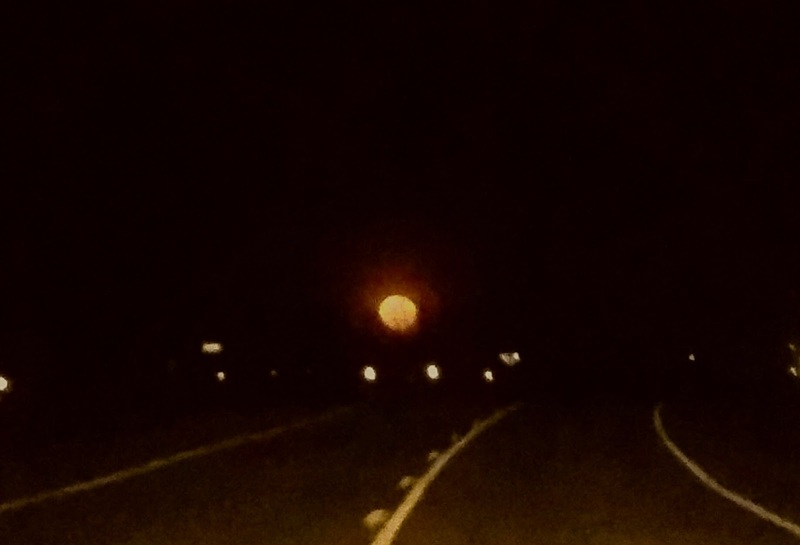 As I hit the road a great big red full moon rose above the horizon. My third evening on the prairie finished up fairly remote. Canadian radio stations were stronger than any American ones I could find. It was the last day I'd have the time between the end of work and a hotel to fish. I had ideas about creeks I'd like to test - more than I'd be able get to. I'd been on a few around there in the past, but there are so many others yet to try. It's not an area known for fishing. A spot here and there, but nothing on anybody's bucket list. But that's the beauty of always being ready to fish - hitting obscure water and discovering hidden gems. Being somewhere different and having the excuse to get out and walk in it. The wind was howling this day at a sustained 30 miles per hour with gusts to 50. The sort of weather you'd avoid if at home. I was near a lake I knew held pike. Maybe being on the leeward side of the big water would be manageable. 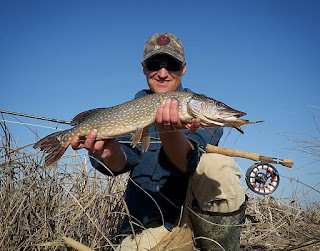 Pike ought to be up the creeks, and that's where I wanted to find them anyway. I stopped where the road crossed over the main drainage in this stretch of prairie. The lake is essentially a wide spot in the creek - a valley into which the creek flows in and out of under the same name. 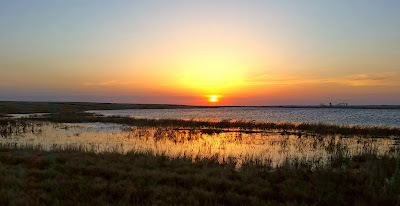 Numerous other lakes dot the map here on the western fringe of the prairie pothole region. Standing on the side of the road and looking out across the wetlands interrupted by meandering creek and bordered by broad shallow lake made me think of salt marsh. Even the high ground was crusted over with white alkaline deposits left behind by evaporation. 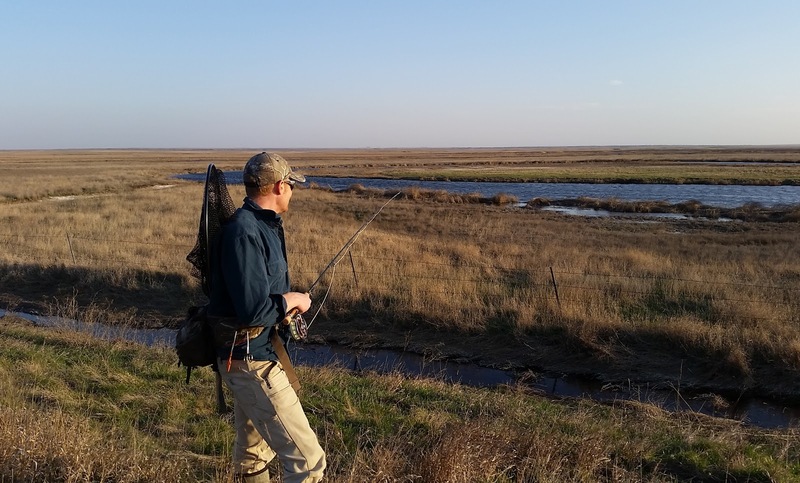 Walking the overly-windy meandering stream among flooded grasses took me back to my days of looking for tailing reds on Texas salt flats or flounder in coastal Carolina creeks. Muskrats took the place of gators cruising the channels. Waterfowl were everywhere. Even gulls and pelicans were floating on those strong winds. more force. Kind of like where a tidal creek empties into a main channel on the outgoing tide. It seemed like I should be able to find more fish, but I had to remind myself conditions were nasty. Casting was more like flying a kite. The mouse was often lost in the chop. Streamers didn't get any looks either, and I worked some pretty heavily for quite a while. But this one fish was satisfying enough. Despite the roar of the wind, the sound of the topwater hit snapped me to attention and brought my rod tip up into a hookset as the line tightened. 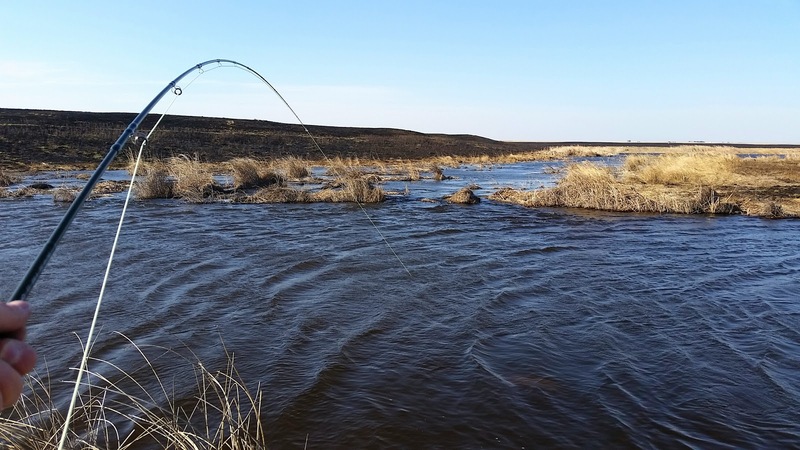 The fish surged to the middle of the stream, made a few runs, and then came close again as northerns will do. 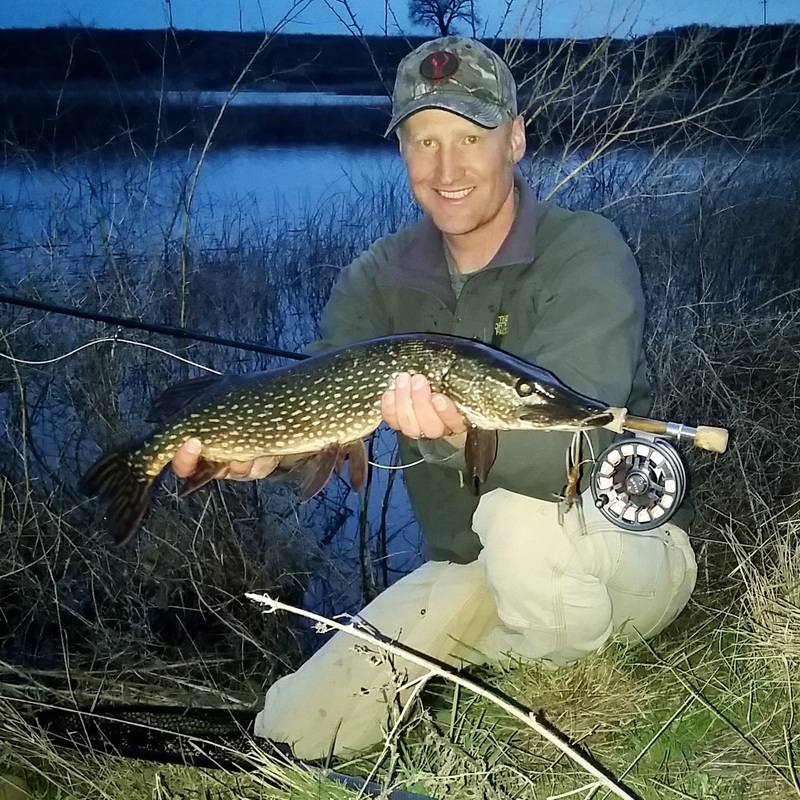 I stamped down a space in the grass big enough to take a picture, then landed the pike and returned it to the water. I look forward to when I'll be there again. It's out of the ordinary. It's out of the way. It's special, yet plain. 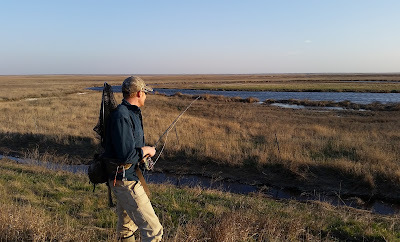 Fishing is a bridge that, for me anyway, connects a person with a place, a piece of ground, its water, and its wildlife. It allows access and a means of experiencing. It turns any road crossing over any nondescript piece of water into a potential portal to outdoor adventure. Which of course you would miss if you didn't always travel with fishing gear.